Chess - Sport Club for Integration (S.C.I.) "Vitosha"
Is it easy to play chess? If it’s just like that, then it’s not hard. Beating the computer at it on the other hand is much more difficult, although a computer is not "a rational being". Can a visually impaired person become a world chess champion? Yes! This legend shows the genius that this chess board is- it is a vast field of countless combinations. For example, just for his first move the player can choose among 20 possibilities and his opponent can reply in 20 ways to each one of these moves. So there is a choice of 400 variants just on the first move. Nowadays chess is popular among people of different ages and genders. It’s a game without boundaries but with strict rules to it, that are regulated in detail by the World Chess Federation (FIDE). Chess for the blind and partially sighted in its essence and the depth of thought required is the same game because the lack of vision is not a boundary for the participation in different sport activities. The important thing is for certain suitable conditions to be provided. These adaptations are purely "mechanical" and concern the chessboard, the chess-men and the timer. Chess-boards need to be at least 20X20 cm, the black squares have to be slightly elevated. A hole in each square has to accommodate pegged chess-men. 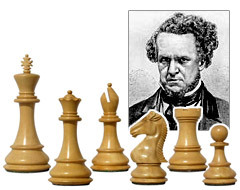 Chess-men themselves must have a Staunton design so that the black pieces are additionally tactually marked. This typical design is named after the famous british chess-player Howard Staunton, who proposed a modification of the chess-men’ design in 1849. A timer is used that is especially constructed for people with visual impairments: a face with reinforced on which every five minutes are marked with a dot and every quarter is marked with two elevated dots. There is also a flag that could be easily tactually felt and that enables the player to feel the minute hand throughout the last five minutes of every hour. There are also requirements in place that regard the announcement of moves, the recording of the game, the behaviour of judges/referees, etc. All of these are detailed in FIDE’s handbook. Tournaments. Chess is played by people of all ages. European individual and team championships, world championships and many regional tournaments are held by different sport organizations. During a competition between visually-impaired and sighted players each one could request that two checker-boards be used so that the sighted player uses an ordinary board and the visually-impaired competitor uses an adapted one. During the game the moves are clearly announced, they are then repeated by the other participant and are made on his board. 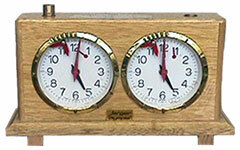 A special timer is used. The visually-impaired player is entitled to a helper who can: make each move of that player on the opponent’s board, announce the moves of both competitors, record the result of the visually-impaired player and start the opponent’s timer. The assistant is also responsible for all the formalities when a game is canceled. Chess in Bulgaria is extremely popular and has many worshipers. These range from the puzzled players in the park in front of the National Theatre “Ivan Vazov” in Sofia to the world champion Veselin Topalov. Chess aficionados know what ELO is: it’s a chess coefficient or a system for relative evaluation of a player’s strength. This is calculated using a strict methodology devised by professor Arpad Elo and was approved by FIDE in 1970. According to ELO, chess players are divided into nine classes. The lowest is novice and the highest is grandmaster, whose aim is to become a world champion. A rank list has been made of the best chess players and their best ELO coefficient. Some players on that rank list are Veselin Topalov, (2nd ) and Ivan Cheparinov (33rd). Chess in SCI Vitosha. Since the very beginning chess is widely played within the organization. In September 2001 two club members took part in the national chess championship which took place in Varna. There are occasionally internal club chess championships. Two years after the establishment of “Vitosha” the first two in the league took part in the competitive annual Balkanic chess tournament in Kosjeric, Serbia. These were Stefan Gergov - the best chess player in the organization and Yanko Petrov. Regular chess training sessions started in the office since 1st February 2006. Georgi Georgiev, the trainer was extremely motivated to achieve high results with the players, who also trained with great enthusiasm. The task that was the soonest on their agenda was to prepare for the competitive tournament in Kosjeric. In June 2006 the Bulgarian chess player Georgi Chernev (together with his trainer Georgi Georgiev) participated in a tournament in Belgrade. He definitely underperformed in this chess forum but his participation surely attributed to the development of this sport within the organization. The participation of Mihail Iliev and Georgi Gergov in the chess celebration in Istanbul could be considered a notable achievement. They were invited personally by Radi Atanasov who led the Bulgarian national chess players to compete in Istanbul, Turkey. Two of the best chess players from the organization took part. In October Mihail Iliev was the assistant of the best Bulgarian chess player Rasim Mehmet Nizam at the world championship in India. In the end of November Nikolay Katzarov- a promising chess player and club member together with the trainer Georgi Georgiev participated in the traditional tournament in Kosjeric, where he took the prestigious fourth place. At the beginning of December 2006 Nikolay Zheliazkov and Aglika Danova, two chess players took part in an international chess tournament which took place in Leskovac, Serbia. In 2007 again Bulgarian chess players took place in the Kosjeric tournament. The chess team of SCI “Vitosha” participates regularly in the republican championships that are organized by The Union of The Blind in Bulgaria (UBB). A good relationship on the basis of chess has been established between SCI “Vitosha” and the club of the visually impaired in Kjustendil. Time and again the team has participated to tournaments in the capital and in the country with the main goal as many chess-players as possible to take part regardless whether they are the best ones.